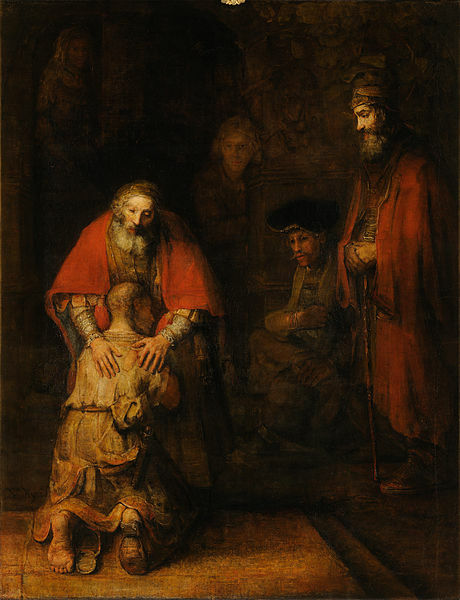 This post, like last post, is focused on understanding the Parable of the Prodigal Son. In the last post, I discussed the way some preachers treat the elder brother as a legalistic person who is disconnected from God because of their legalism and pride. I explained why I didn’t think that was the correct understanding. I want to post a brief explanation of the context of the Parable of the Prodigal Son. It is a well-known parable. But we often short-circuit what Jesus was trying to teach by ripping the parable out of its context. Jesus tells the Parable of the Prodigal Son in Luke 15:11-32. It is the third of three parables that Jesus tells. The first two are the well-known Parable of the Lost Sheep and the Parable of the Lost Coin. Most people even somewhat familiar with the Parable of the Prodigal Son probably know that it is a part of a series of parables. And we all know that these parables teach us about the love of God for the lost, his desire for the lost to be saved, and his joy when they are reached. But most people are unaware of the reason Jesus tells these parables. Jesus tells these parables because the Pharisees and the teachers of the law were criticizing him for “welcoming sinners” and having fellowship with them through eating with them. That’s the target Jesus is aiming for. Notice what this isn’t. Jesus isn’t criticizing them for not evangelizing. He’s not criticizing them for disbelieving that sinners can turn from their sins and return to God. The Pharisees did not deny that. In other words, Jesus admits that the Pharisees wanted people to turn back to God. That’s not the issue. And, yet, if you listen to most sermons and lessons on the Parable of the Prodigal Son (and the Parables of the Lost Sheep and the Lost Coin), you will hear ministers preaching as if the main point of the parables is to show us that God welcomes back sinners. But that’s not at stake. What is at stake is how we relate to the sinners and outsiders. The issue is not whether we evangelize, but how we go about that evangelism. The Pharisees wanted to separate themselves from the sinners and outsiders. Jesus pursued them, loved them, and showed them in tangible ways that the Kingdom of God was breaking into this world. He joyously celebrated when they returned to God rather than remaining aloof due to arrogance. The trouble with misreading a parable like this is that we miss its point. We aren’t listening to the way that Jesus wanted it to challenge people. We read it. Study it. Learn from it. But we often learn comfortable lessons from it. We remind ourselves that God will always accept us back and that God is a gracious God. And these lessons are important. But Jesus wants to learn these lessons about God and have their relationships to the outsiders and sinners impacted. We need to learn those lessons, too. Many ministries are becoming more “missional” (though I know that is an overused buzzword) and finding ways to build relationships with people outside the Kingdom of God. But many churches still form their communities in a way that isolate their members from non-Christians. Christians invest most of their time and energy in relationships with other Christians (usually not even to mentor or to disciple them); they leave little time for non-Christians. If we don’t understand the Parables of the Lost Sheep, the Lost Coin, and the Prodigal Son in their proper context, we will miss that Jesus is challenging our very ways of creating “holy huddles” or whatever you want to call it. Jesus is telling us about a God who pursues and embraces the lost. If the church is going to listen to and follow Jesus, then we will have to follow him when he calls us out of our comfort zones and well-designed church programs into the messiness of relationships with the lost and marginalized. Otherwise, we’ve missed the teaching from these famous parables.